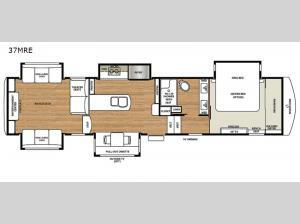 Five slide outs, a rear entertainment center with a 60" Smart TV, plus the comforts of home can be found throughout this RiverStone 37MRE fifth wheel. There is plenty of space inside thanks to all of the slide outs. In the living area there are two hide-a-bed sofas, theater seats, and a fireplace for those chilly evenings. Enjoy your meals or another cup of coffee at the pull-out dinette, plus there is plenty of storage with the pantry and the 18 cu. ft. French Door refrigerator with an ice maker. In the bathroom there are two sinks which makes it easier than ever to get ready for the day!